Playing such a crucial role in the home, it's vital that your oven is fully equipped with the necessary features to allow you to create culinary treats for all the family to enjoy. Bringing together innovative technology and contemporary design, Candy ovens are sure to make your kitchen a more exciting place with their special features and state-of-the-art functionality. Our extensive range of Candy ovens includes the Candy FDP6109X Electric Double Oven, the Candy CCOM6099/6X Electric Oven, the Candy FVPE729/6X Electric Built-under Oven, and the Candy FC7D415NX Electric Double Oven. 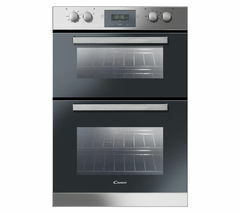 Whether you're preparing a pizza, cake, or lasagne, or perhaps a full Sunday roast, these Candy ovens are kitted out with the latest features to ensure they always offer optimum performance, including adjustable grills, easy-to-use touch controls and LED displays, and so much more. Of course, with any oven, safety is always a priority. These models feature integrated cooling fans that circulate air continuously around the ovens' controls in order to protect them and your surrounding furnishings and worktops from getting too hot. This smart system also prevents condensation forming on the inside of the oven door, whilst ensuring that the exterior remains cool and safe to touch. 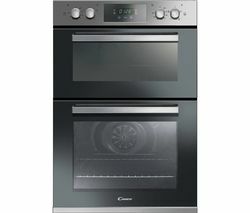 And, if you regularly cook multiple dishes at once or cater for a number of people, the Candy FDP6109X Electric Double Oven offers ample space (92 litres in fact!) to achieve delicious results every time. So, you can rest assured that, whether you're cooking a quick, mid-week meal for the family or a three course banquet for a special occasion, your Candy oven will ensure that your dishes are cooked to perfection, with minimal stress and fuss. Whether you're looking for a built-in double oven or even range cookers, our huge collection of kitchen appliances is sure to have exactly what you're looking for.